Check out our review of the Brand New Tracfone Motorola W370. The GSM W370 is currently only offered if you are in areas where At&t (formerly Cingular) is the main provider that Tracfone and NET10 are using. This new phone appears to be the little brother to the best selling Motorola Razr. The new W370 is thicker but narrower. The keyboard is the same flat design as the Razr. The distinctive Chin on the Tracfone Motorola W370 lets you hold the phone and text with one hand better than if the phone was thinner. One handed texting and the solid feel make this one of the better selling Net10 and Tracfone models. Tracfone has just started including the Doubler card installed on the Motorola W370s. This card is normally $50. The W370 is also on sale for $50 (what you will pay for the doubler card for other phones). Buy a Motorola W370 phone for $49.99 and get double minutes for life! The Motorola W370 is a single rate Track Phone. All the calls you make in the USA are one unit per minute. This includes international calls also. You can make calls to sixty different international areas for one unit per minute. Check out Tracfone International Calling. 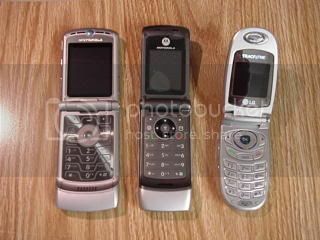 Moto Razr Left, Motorola W370 Center, LG 3280 Right. The new W370 texting charges are .3 units per text in and out. This is a lot better than the .5 units per text on some of the other Tracfones. The W370 uses the BQ50 Lithium Ion battery. Since the prepaid cell phone does not have some of the battery draining accessories like double displays, camera, etc the battery life is normally very good. It can last up to 18 days between charges. In real life if it lasts a week between charges you are doing really well. This is dependent on how much you talk and how much time it is searching for a signal if you are out of cell range. The Tracfone Motorola W370 includes a mini USB port to connect the phone to your computer. It is probably possible to backup your phone book to your computer. There will be software issues in trying to hook up your w370 to your computer but I am sure there will be people who work through this. By searching online I think it will be easy to find how to download more ringtones. The headphone jack is handy for areas where it is not legal to talk on a cell phone while driving. Get a Motorola W370 phone for $49.99 with DMFL (Double Minutes For Life)! Tracfone Cellular has a limited web access that is accessible with this phone when you are in AT&T (Cingular) territory. This web browser is really limited. You are also able to build ring tones or download them with this phone. This is the best new phone for Cingular GSM territory from Tracfone Cellular and NET10 wireless. The extremely long battery life coupled with the sleek style, comfortable profile make this a Tracfone Best buy. The doubler card already installed now makes this phone a much better value. The $50 you used to have to pay to upgrade this phone makes phone free. Unless you only use your phone for emergencies this is a better deal than buying the basic phone without the doubler. Buy a Motorola W370 phone for $49.99 and get double minutes for life! The W370 has been selling very well for Tracfone and now the sister company NET10 Wireless is selling it also. Check it out at the Net10.com website. Check out the Tracfone Motorola W370 at TracFone.com! 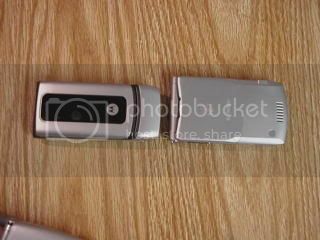 This Picture shows the Tracfone Net10 Motorola W370 on the left with a Motorola Razr on the Right.